Actual better air customer before/after air duct cleaning pictures! HVAC AIR DUCT CLEANING & DRYER VENT CLEANING FOR YOUR HOME AND OFFICE. At Better Air we take pride in providing Quality HVAC Air Duct Cleaning services for your home and office. Our certified and trained professionals provide HVAC Air Duct cleaning services that meet and exceed what is required by the National Air Duct Cleaning Association (NADCA). With certified badges such as Air Systems Cleaning Specialists (ASCS) you can rest assured that Better Air professionals can restore your HVAC system back to its peak efficiency, leaving the air in your home and/or business clean, fresh and healthy. Better Air also provides professional Dryer Vent Cleaning. Dryer Vent Cleaning is a service that is recommended yearly to ensure a safe and efficient home. At Better Air we wont just clean your air ducts we will provide you with a before/after picture report and video on every job! 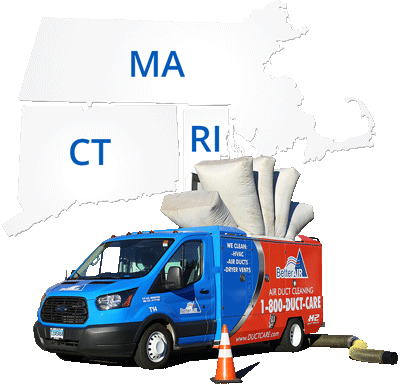 With our Corporate office located in South Windsor, Connecticut Better Air Strives to be the #1 HVAC Air Duct Cleaning Company in Hartford, New Haven, Fairfield, Boston, Worcester, Springfield, and Providence. For Quality Air Duct Cleaning and Dryer vent cleaning services guaranteed Call Better Air at 1-800-DUCT-CARE or Submit a Service request Today! Actual Air Duct Cleaning pictures from Better Air's Customers. When you are looking for a quality air duct cleaning & dryer vent cleaning company for your home or office call Better Air at 1-800-DUCT-CARE. Check out some of our customer cleaning videos: This is what your home or office air duct may look like. VIDEO: Technician cleaning Fiber Glass Air Duct. VIDEO: Technician cleaning a sheet metal RETURN air duct. At Better Air, we specialize in HVAC duct cleaning services and dryer vent cleaning services. As a duct cleaning company, our professionals treat your duct work with care, not as a mere afterthought like some HVAC duct cleaning companies and technicians. If you ask most people to define HVAC, they'll probably just point to the unit out behind their house or the big equipment on the roof of the neighboring office building. The average Joe doesn't think beyond those visible pieces of the system or beyond "it's what keeps us cool." But the truth is that those HVAC and A/C units are just one part of an HVAC system. The other major component is the HVAC ducts running through the entire home or building. Think of the unit as the heart and the ducts as the arteries. It's just as important to keep the arteries in good shape as it is the heart! This is why it's crucial to hire duct cleaning services, and we think the best choice is to go with a dedicated duct cleaning company like Better Air. Why is it important to hire an HVAC duct cleaning service? It's simple: over time as air is processed by the handlers and blown through the ducts, they will accumulate build-up. This happens anywhere, from a pristine office to less pristine industrial buildings. This buildup can lead to clogged HVAC vents, decrease the efficiency of the system, and even strain or damage the main unit, since it has to work harder to pump air through a dirty, clogged up system. This is a situation where spending a little now to keep your duct system clean can save a lot later. Similarly, dryer vent cleaning service is important for your home or business. The principle is the same. We all know the experience of cleaning out the lint filter in the dryer at home, and most of us know what it's like when we forget to do so for a few loads. The filter gets really full, and can even be hot to the touch. The dryer isn't working as efficiently as it should. Well, the filter doesn't stop everything, and over time this same kind of build-up can happen in your dryer vent. If left unaddressed this can even become a dangerous fire hazard, as dryers produce heat, the build-up can be flammable, and often the venting tube is in an enclosed space. If you’re ready to hire a professional duct cleaning company to meet your HVAC and central air duct cleaning service or dryer vent cleaning service needs, give Better Air a call today. 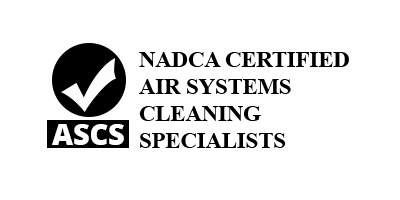 Our NADCA certified Air Systems Duct Cleaning Specialists are here to meet your needs in a prompt, professional manner in Connecticut, Massachusetts, and Rhode Island. Why choose Better Air to clean your HVAC Air Ducts? 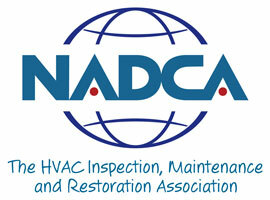 We Are a NADCA certified Company. A+ BBB Rating, A Rating on Angie’s List. Air Systems Cleaning Specialist (ASCS) on staff to answer all of your question or concerns. Before/After Pictures and Videos on every Job. All Technicians Complete 1200 hours of field training and NADCA’S Ventilation Maintenance Training program. At Better Air Customer Satisfaction is our #1 Goal. We offer a 90 day guarantee to ensure our customers are satisfied. Terms of guarantee are available upon request.